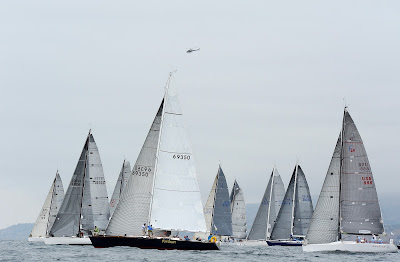 Unseasonably overcast rainy skies greeted the 21 starters today in the 2013 Transpacific Yacht Race from Los Angeles to Honolulu, or the Transpac. The teams representing Australian, Canada, Japan, and the USA set off at 1300 local time from the start line off Point Fermin in San Pedro for the 2225-mile race to Diamond Head, just east of Honolulu. These were very abnormal conditions for the start of this biennial ocean racing classic, with light and variable breezes from the south prompting teams to sail off the starting line on port tack, unlike most starboard tack starts. 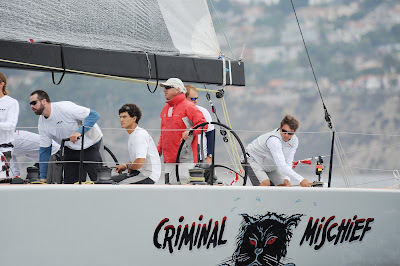 The unusual conditions also had some teams already loaded with spinnakers on their bows and ready to deploy. Typically these downwind sails are not seen until the second or third day of the race. The current weather predictions have the fleet sailing in light and variable conditions throughout the remainder of today and throughout the night until they reach about 120° W longitude. There the influence of the coast starts fading away and the prevailing nor 'westerlies circulating around the Pacific High will start to reach this group to help get them farther and faster down the track. The problem is that this is over 120 miles to the west of the start area, and at current rates of speed about 24 hours away for some boats, so it could be a long night ahead for these crews. It will stretch the memories of Transpac historians to remember when downwind gybing was needed to approach the West End of Catalina Island, the last point of North America these yachts will see for the next week or more. This slow progress for Divisions 4, 5 and 6 is in start contrast to the first wave of starters on Monday who shot off the coast in perfect 10-20 knot conditions and are still enjoying good breeze some 600 nautical miles down the track towards Hawaii. 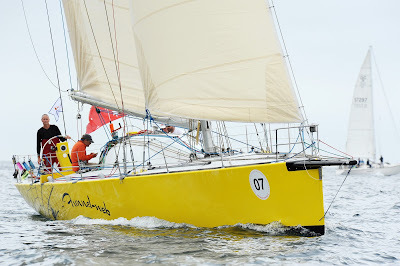 Division 8 leader on elapsed time is Bob Hayward’s Seastream 650 Manatea, who has stretched to over 50 miles ahead of the Ross Pearlman’s Jeanneau 52 Between the Sheets by barrelling down the track at 9.3 knots. On corrected time, however, it is Rob Simonson’s Jeanneau 44 Sleeper who was leading this class at this morning’s 0600 sked by nearly two hours over the runner-up, Matt Brooks’ classic S&S 52 Dorade. The spread in Division 7 is much tighter, with only 26 miles separating the entire group of six boats, with the two Japanese entries taking the lead. Yuichi Takahashi’s First 40 ten quarter and Hioshi Kitada’s X-41 KIHO were within a mile of each other at the morning sked, while it was a third Japanese entry, Kazuhiro Nakajima’s R/P 44 Gefion, leading on corrected time by over six hours.